Featuring Beatrix Potter. "Her drawings began in childhood, her stories came to life in the Lake District". Fun and Adventure. Sailing boats. Trees. Plants. Harrison Stickle. Pike of Stickle. 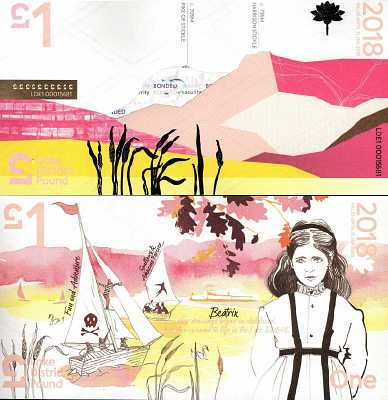 The Lake District Pound is designed to boost trade in local businesses, as well as create profit through souvenir sales, and will be used to help fund community and environmental schemes. It has been developed by the Lakes Currency Project, an independent start-up company set up by Ken Royall, who lives near Windermere and is originally from Barrow. Profit from souvenir sales will be used to fund community and environmental projects.